(2011 A Thousand Words Contest) Something has upset her little brother Mouse, but Willow doesn't think she needs to intervene. Willow heard the whimpering the moment before she reached out to pull back the leather flap that covered the entrance to her mother and father's den. The sound made her freeze in place. Even though it was almost inaudible, it grated on her nerves as though it were being trumpeted into her ear. Why, in the name of Badger's Blood, was Mouse crying now? Willow paused for a moment more, debating not going inside. She had wanted to step in out of the cold, but this changed things. Her brother was a pest and a shadow at the best of times. He was unbearably clingy when he was upset. And, what was more, Willow didn't want to somehow become shouldered with the burden of cubsitting her four-turns-old brother when he was crying. She already had other plans for her evening. She would leave. Now. Willow turned to descend the Dentree when her mother's muffled voice called out from within. Her mother, who was sitting in her bedbowl with her crying son cradled in her lap, merely nodded. Mouse's sobbing intensified at the conclusion of Finch's answer, and Willow grunted a �Huh,� in response. If she had to guess, it was Snowflake who was causing the problems. Sickly little Fadestar couldn't hurt the feelings of a fly even if she wanted to. For a moment, Willow let herself wonder what the problem could be, and then she made herself stop. Agemates fought sometimes. It was the way things were. She couldn't count the times she had got into her own scuffles and arguments when she was Mouse's age. More than likely, whatever was eating Mouse would blow over like a summer storm, and he'd be back to chasing his friends' shadows again... which was preferable to him chasing hers. Willow looked at her mother, who had fallen silent, but was still trying to comfort her son. Finch hadn't asked her to stay, and Mouse's crying was really starting to wear on her. �I'm going to see if Father's at the river,� Willow announced as she turned to duck back out of the den, and left it at that. Willow's feet crunched through a crusted layer of snow as she made her way back to the Holt. The air had that familiarly crisp bite to it, and the wind had begun to pick up. It was going to snow soon, and the whole forest knew it. That was why, she reasoned, her snares were all empty. Anything with half a brain would be finding shelter before the snow started to fall. Willow shivered and hugged herself under her heavy winter poncho. She was appropriately dressed, but she still felt cold. She wanted nothing more than to find a warm den somewhere, preferably one with a warm furmate or two to wait out the coming storm. Willow stopped in her tracks. That was a question her brother had asked her countless times, but he wasn't talking to her. Why wasn't he at home, inside, when bad weather was coming in? Who was he with? She sniffed the air for a clue, but only got a noseful of bitter cold. The response to the cub's request was a snarling, �No!� that carried unspoken undertones of, �leave me alone!� Definitely Snowflake's voice. Curious now, Willow took a few more steps past some thorny, leafless shrubs to see if she could see what was happening. Upwind, in the near distance, Snowflake sat atop her wolf-friend, Growler, while Mouse scurried at the wolf's heels to try and catch his 14-turns-old agemate. Growler was spinning, happily playing his own version of 'keep-away' to avoid the cub's advances, but Snowflake wasn't treating this like a game; the snarl on her face made that painfully clear. Willow stayed back and watched. The situation seemed painfully familiar to her: Mouse was not going to take no for an answer, and would keep pressing until he got his way. She knew it could take half a day to shake the cub off her own heels when he wanted to be around. She was sure her younger, more wolfish tribemate would be far less patient. Willow lunged forward. Sure enough, the situation was quickly getting out of hand. A sudden, strange, sense of protectiveness toward her brother rose within her. Growler, grinning and seemingly oblivious to his bond's quickly souring mood, spun around to 'keep-away' again, and this time, with a snarl, Snowflake leapt from her wolf with teeth bared. It became very clear what the young female's intent was. �ENOUGH!! !� Willow bellowed. The sudden outburst made Mouse, Snowflake, and Growler stop short. Snowflake guiltily averted her gaze to the ground and fell silent. Mouse meekly nodded. His lower lip began to tremble. Snowflake's response was to mount her wolf and head in the suggested direction. Her unchecked trap-lines were forgotten. Willow knelt down so she could look her brother in the eye. �She didn't want to,� she explained, and quickly added, �and she doesn't have to.� Oh, how she wished she could get her little brother to understand that concept. Mouse fell silent, save for soft, sad, sniffles, obviously thinking hard about what his sister had just told him. Willow didn't know what to do to comfort him except to keep holding him. Finally, when Willow's knees were starting to ache from kneeling on the cold, hard ground, the cub finally let go of his sister's neck, wiped his mittens across his teary eyes, and nodded a quiet acceptance. That was Willow's signal to � gratefully � push herself to her feet. She stretched her aching muscles and took a step toward the Holt... only to notice Mouse wasn't following. He just stood there, frowning and staring in the direction his friend had ridden. �She probably won't let me play with her any more,� Mouse sighed. �Do you really think so?� the cub gasped, wide-eyed again. �I do,� Willow lied. More than likely, though, Snowflake would quickly forget being angry, just as wolves did. It was almost the same thing as being sorry, right? �And, anyway, if she doesn't listen to you, I'll box her ears so hard they'll be ringing for a moon,� Willow joked. It made Mouse giggle. Mouse shouted, �Yes!! 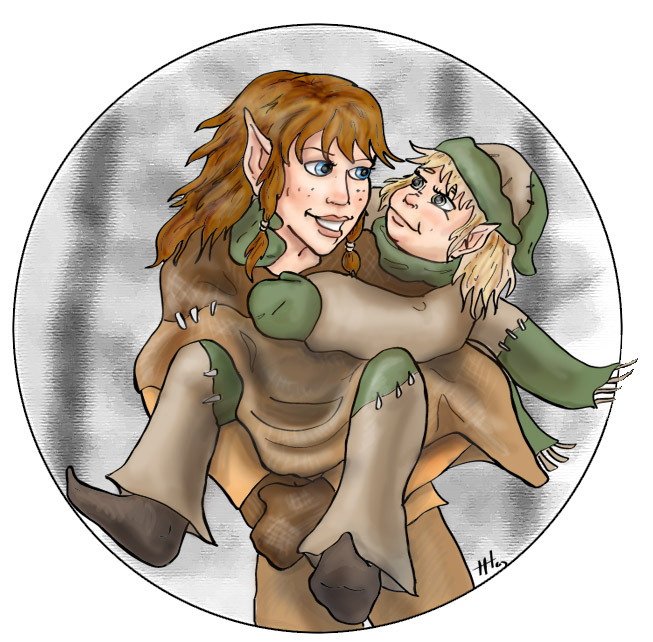 !� and wasted no time in clambering onto his sister's back. He giggled as Willow rose to her feet and loped homeward.